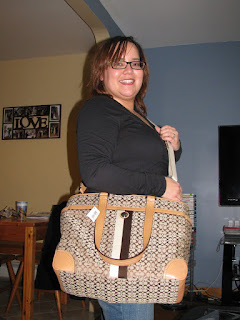 Life with Giggles: Is that a Coach bag? Oh yes it is. Is that a Coach bag? Oh yes it is. So today I got home to a very nice surprise! I walked into the bedroom to see a HUGE Coach bag sitting on the dresser. At first, I thought that maybe the hubs had to bring something home from work and that was the only bag that was available. Wrong! Boy was I wrong. A good wrong! I went and took this lovely bag out and pretty much stayed in a moment of shock for about 10 minutes. I immediately took out my old bag and started finding a home for all my stuff! It was a complete surprise that my hubs got it for me for no specific reason. I <3 him so much. He always makes me smile. Edit: I forgot to also add that he also gave me a box of chocolate covered strawberries too! My favorite. The hubby was pressured by Girl Scouts! It's a geyser in my kitchen!